What Does GTD Mean? And, no, it's not a disease. What Does GTD Mean? And, no, it’s not a disease. You hear it all the time – people talking about the GTD method when it comes to productivity and to do lists. 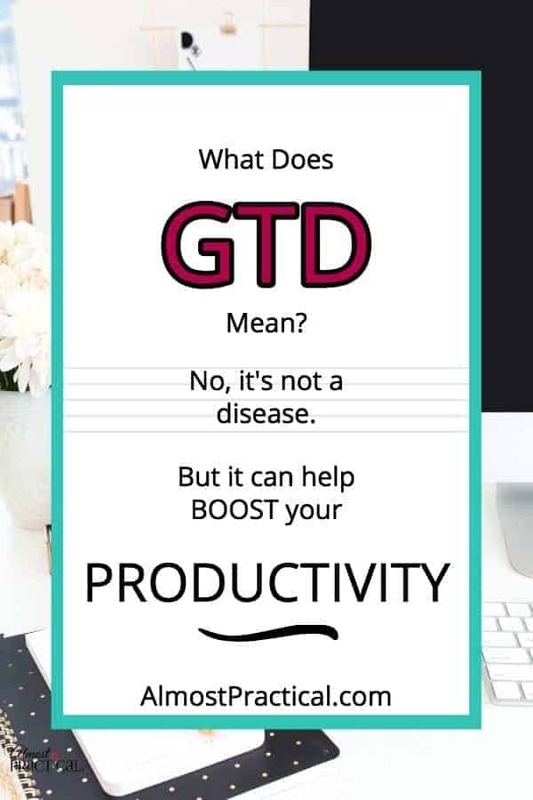 But what does GTD mean, really? On the surface GTD stands for Getting Things Done. Yay! In fact many people think it's a generic term – a simple abbreviation. You know, how someone might typle LOL instead of laugh out loud. But actually the true GTD meaning is a system or a method for getting things done that was founded by productivity guru, David Allen. He wrote the book called Getting Things Done, The Art of Stress-Free Productivity back in 2001 (updated in 2015) and it's developed a cult-like following over the years. Disciplining yourself to make front-end decisions about all the “inputs” that you let into your life so you will always have a plan for “next actions” that you can implement or renegotiate at any moment. But if you are overwhelmed with too much to do, then you know it's not. These days we are bombarded with a constant stream of information from so many different sources. Email, snail mail, text, social media, work networks, etc. – it is almost impossible to keep up. Back in 2001 when the first edition of Getting Things Done was published, the world was still largely dependent on paper. Yet we still felt the overwhelm, even though we only had a fraction of the inboxes that we do today. Getting Things Done was actually one of the first productivity books I ever read, and from then on I was hooked on GTD. With 3 small children at the time, I had so much paper clutter that I just couldn't keep up. So, I started looking for a way to be able to file my papers and still be able to find what I needed when I needed it. GTD was the light at the end of the tunnel for me. And the GTD methodology still applies in today's digital world. The first objective of GTD is to capture everything and anything that you need to get done. All day long we come across things to do in our lives – things big and small. There are routine things that we do every day – like empty the dishwasher and feed the dog to more complicated things like prepare for that job interview. Then there are those annoying regular things that you only need to do a few times a week – like put the trash out on the curb. We are much more likely to remember the big hairy things like the job interview and forget the smaller seemingly unimportant things like taking out the trash. But you know what happens if you forget to take out the trash – you have to wait a whole another week and it starts to overflow, not to mention the smell. That's why capturing information is so important – even the smallest things. The second objective of GTD is more complex, even the wording is harder to wrap your head around. This is where you create a habit or process that you can rely on to take all those to do items that you captured and create an action plan to make everything happen. Your action plan can be as simple as just doing the item or even making a decision NOT to do it. Believe it or not, the act of making a decision not to do something is still an action. However, some items on your to do list are more involved than others. These items require multiple steps to complete. Because they need more than one step to complete – they become a project. In our examples above, taking out the trash would typically be a one step to do item. You see it on your list, you take out the trash, you are done. When it comes to GTD you need to first think about the results that you want, and then come up with the steps you need to take to get there. If you are interested in boosting your productivity and finding a way to manage all the information that hits you everyday, then you need to gain a basic understanding of GTD. Many of today's productivity apps and methodologies are built on a GTD foundation. You certainly don't have to follow it to a tee. In fact, a productivity system is very personal – what works for one person will not work for another. But if you have the general principles down, then you can modify it to suit your needs. To master the basics you can read David Allen's groundbreaking book Getting Things Done – it's available in paperback, on Kindle, and even on Audible if you prefer the audiobook version. You can also visit David Allen's website and follow his 5 step formula to GTD. In a future article, which I will include here, I will do a full review of David Allen's Getting Things Done book and the system of 43 folders which he made famous. If you would like to follow along via email, please use the form below to subscribe to the Almost Practical Organizing & Lifestyle Newsletter.